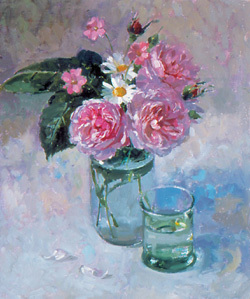 Pamela Kay is one of Britain’s foremost painters of flowers and still life. Working mainly in her studio, her work reflects her love of flowers and everyday objects, which she arranges in a very informal way. In this film she paints spring primroses in a blue jug, summer roses from her garden and a delicious looking bowl of strawberries in a silver bowl. 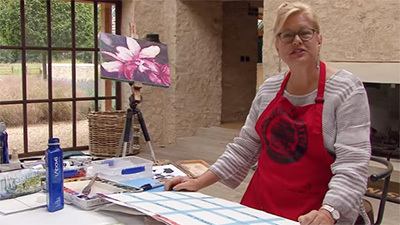 She also takes her paints to the celebrated Sissinghurst Castle Gardens in Kent where she paints the rose arbour in the White Garden. 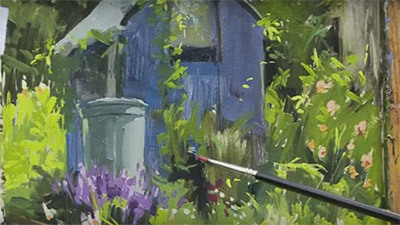 Pamela Kay is very well known to readers of Leisure Painter and has an enviable reputation as one of this country’s leading exponents of flower and still-life painting, so it was lovely to be able to see her at work in her new film, Aspects of Flower Painting in Oils. Here she tackles four varied flower subjects – from a small study, to a view of the White Garden at Sissinghurst Castle. Pamela likes to paint flowers as they come into season, and sees the arrival of the primrose as the start of the painting year. 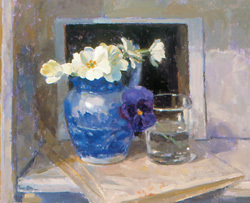 The first painting features primroses in a blue and white vase, contrasted with a purple pansy in a clear glass of water. She sets these on small shelves, against a dark postcard for background. This has the effect of placing them within a theatre, dramatically throwing out the colours. Before painting, Pamela shows how she lays her palette out, organising her colours for ease of use, and then how she deals with the terror of the white canvas, washing in the background colour, right across the space. 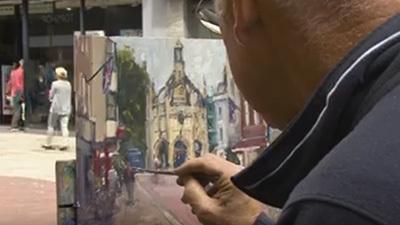 She firmly believes that a lively underpainting is important for the success of the final image since this creates the foundation of the overall tone. 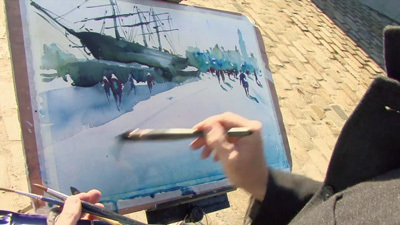 Pamela then quickly builds up the forms, all the while explaining how to look effectively and paint what you see. 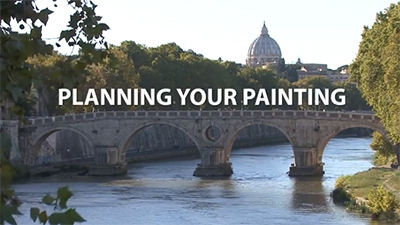 Useful tips are offered, such as turning the canvas upside down to check the symmetry of a vessel. The second composition features old-fashioned multi-petalled roses arranged in a jam jar on a white cloth, with geraniums and daisies to add variety and interest. Pamela advises not to be overwhelmed with detail too soon, but to keep moving around the painting to ensure the overall balance is maintained. The scale changes dramatically in the third image where she moves outside to paint the rose arbour in the White Garden at Sissinghurst Castle. Here she lifts the mass of greens with a complementary orange, working on a strong structural base. her beautiful paintings gradually emerge from the colourful mesh of brushstrokes. Pamela Kay’s wonderfully skilful oil paintings of flowers are exuberant. In Aspects of Flower Painting in Oils, Pamela shows us how, throughout the year, there are always interesting and challenging flowers to paint. 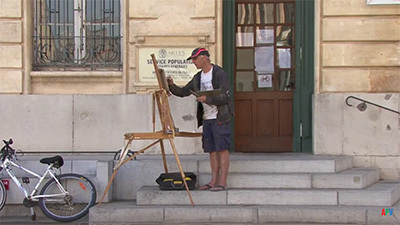 Her demonstrations are full of useful tips and advice, as well as a joy to watch. There are paintings of spring primroses, exquisitely depicted against a dark background and perfectly complemented by a deep purple pansy; summer roses; strawberries in a silver bowl; and a stunning part-location, part-studio work of the celebrated White Garden at Sissinghurst Castle in Kent. 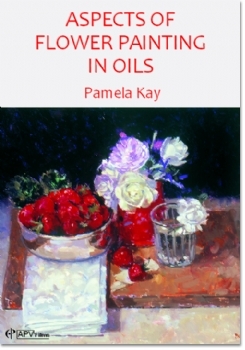 Each of these gives a fascinating insight into Pamela’s enviably relaxed and confident working process.